Stale? Or acceptable? One way to assess the shelf-life of bread is to use simple and subjective sensory evaluation (does it feel right in the hand and mouth). A Food Technology Corporation (FTC) food texture analyzer, however, can provide a much more accurate measurement for what is described as acceptable, and go on repeating the same test reliably, time after time. Has formulation improved shelf life? Can packaging or storage be better? The only reliable method of measurement is mechanized texture analysis, informed by initial sensory perception. The testing described here illustrates how freshness can be assessed, measured, and then those measurements applied to a texture analyzer for accurate and repeatable testing of a product. The data, however, reveal a much richer picture than just a measure of freshness. A Food Technology Corporation (FTC) TMS-Pro Texture Analyzer was used, fitted with a 25 N intelligent loadcell and a 36 mm AACC cylinder probe. Samples were drawn from the same loaf of bread and tested in the same way, but half the samples were left out overnight to dry and go stale, creating a significant difference to be measured. For each compression, the test program moved the probe until it touched the surface of the sample. 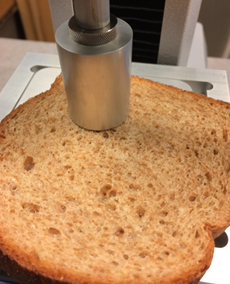 It then moved the probe 5 mm into the bread at a speed of 100 mm/min, before returning at the same speed to the starting position. This allowed sufficient compression, but safely within the thickness of the sample. The TL-Pro software then automatically calculated both the firmness of the product and the work done (energy) to compress each sample. There is clear separation in the traces of the fresh and stale groups, which is a direct measurement of the different degrees of firmness. 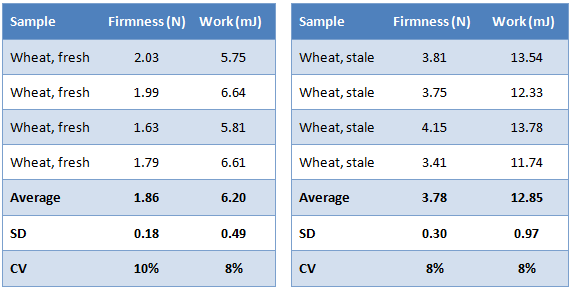 These results, with a CV of 10% or less, demonstrate a valid methodology for objective measurement of how varying conditions affect the texture of a sliced bread product. There is a significant difference between the samples of fresh and stale samples: the stale product was almost twice as firm as the fresh product. Lower degrees of staleness will reduce the separation, but groups will remain distinct. This offers the ability to measure how variations in storage conditions, packaging or formulation affect the final product, allowing food processors to develop methods to control changes in texture. There is more detail available in the shape of the graph curve, which is characteristic of a product. This allows more comparison between products and formulations than just freshness, and ‘ideal’ samples can be used as a quality base line in production testing, for consistency.